Everything you need, except fruit, sugar and bottles, to start making your own country wine. 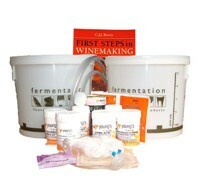 This kit contains enough ingredients to produce 6 bottles of wine. All of the equipment can be used many times and almost all of the ingredient packs will produce more than 6 bottles of wine. For your second gallon you will only need grape concentrate, finings, corks and labels. Working from the recipes in 'First Steps to Winemaking' which is included, you will soon become expert at making 100’s of different wines from fruits, vegetables, flowers, grains, juices and concentrates.